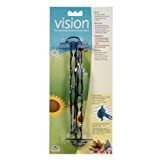 Ergonomically designed Vision Perches feature a unique multi-grip surface that promotes foot circulation and helps prevent foot problems in birds. The perches are designed to be accessed from the exterior, a non-invasive approach that reduces stress on your bird during cage maintenance. Installation is easy, simply insert the perch between two cage bars and rotate 90 degrees to lock in place. For use on cages with horizontal bars only. Requires a bar spacing of 12.3mm (½ in). Fits Vision cage models 100, 110, 210, S01, S02, M01, M02, L01 and L02. Colour: Blue. 2 perches per package. This entry was posted in Birds and tagged Blue, CAGES, Pack, Perch, Small/Med, Vision by One Boutique. Bookmark the permalink.